Adventurers Leilani Münter and Jeremy Symons join us Monday, December 28, 2009 at 8:00 A.M. Pacific on Blue Planet Almanac radio. Blue Planet Almanac is also re-broadcast later in the week and shows are archived after airtime. HealthyLife.net is an all-positive talk station and has over 3 million listeners monthly in 104 countries and all 50 United States. Environmentalists are where you find them – sometimes in unlikely places. Saving Earth will take our daily, constant action, guided not only by leaders who know what to do in front of cameras and mics – but also captains who can last the grind and hyperbole of government legislative machinery. In both positions, courage and nimble minds are prerequisite for challenging, controversial and sometimes thankless positions where it’s your job to be an agent of change. Realizing this, Blue Planet Almanac strives to remain realistic about humanity’s values and value. Having had long experience as an environmentalist when it was unpopular as well during its highest fashion, one thing remains incontrovertibly constant to me; people tend to avoid things they find inconvenient and gravitate toward those that require minimal effort. It’s simple… humankind won’t act to save its own planet unless it’s pushed, both noticing and respecting one of its own doing something important they like. That means any change is gonna be a messy, sloppy process. This month’s Blue Planet Almanac radio presents you with the adventure stories of both a courageous captain and a leader, exemplified by national racer and international model Leilani Münter and her friend-at-arms Jeremy Symons, National Wildlife Federation’s (NWF) respected spokesman on environmental and energy issues. Münter and Symons predict the tides of environmental change, partnering in advancement of thoughtful environmental values in both public and government arenas. 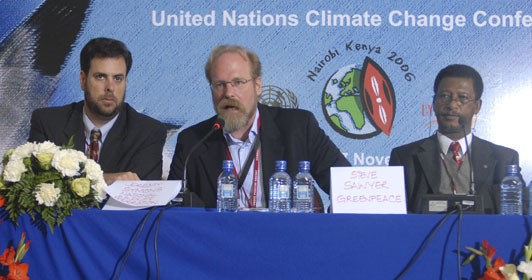 Symons is just returning from Cop 15 on behalf of NWF. It’s my understanding from Jeremy that he was one of the few NGO execs allowed to watch President Obama’s last-minute, but reportedly successful, effort to bring China to the table. But stand back for the moment from what you think about environmentalists and be open to what’s really happening. How would you describe an environmentalist? Think about how you and your friends live. Is your carbon footprint low, can you say you live like David Brower or John Muir did? Do you know how to calculate your carbon footprint? Will you ever want to experiment with living off-the-grid as did Les Stroud? At least 95% us will never answer “Yes” to most of those reasonable questions. Only a handful of us can. We’ve branched so far from our roots we’ve forgotten how they grow. In this moment, few of us can connect the dots from the United States’ use of most of the world’s resources to negative climate and environmental changes. Yet our social and cultural conditioning often insists that whoever creates a mess must clean it up. So, why aren’t we cleaning up our own messes by being, for example, the first ones at Copenhagen’s negotiation tables? When you look at American’s web of resource use and who really has an impact on climate and planetary change, the country that has caused most of the problems has been last to show up. That means you and I. So start from where you’re standing. Now, if you’re interested in creating positive environmental change, wouldn’t you want the ears of the largest audience possible? Which audience would that be in the United States? How about sports fans? Sports are a big deal here, as in every country. Is it football fans who’d listen? You tell me. How about auto racing? It’s big – some say the number one spectator sport in America. Auto racers as environmentalists??? That’s daffy, right? In motor racing, “Going Green“ literally means the green flag which starts the race, making racers plant their right foot on the accelerator pedals of their cars. Now ask yourself if a motorsport like auto racing is going to change most effectively from inside its own ranks. I can think of at least four racers including me who want to continue racing but green it acceptably. And three of them are pro with regular entries in nationally-televised series. But, change things must, and there will be early adopters of new ways of doing things in every sport. The American Le Mans series, for example, in 2009 launched its Green X Challenge sponsored by Michelin and has also partnered with the Nature Conservancy to Adopt an Acre. Now, Münter’s #59 NASCAR ride (National Association of Stock Car Auto Racing) is sponsored by NextEra Energy Resources – and appears to be one of the few cars bankrolled by an alternative energy company in auto racing. NextEra claims it’s the largest wind and solar power generator in America, with over 90% of its power derived from clean or renewable fuels. So what’s accepted as the biggest auto racing series in the United States? How about NASCAR? Would its fans be interested in environmental topics? 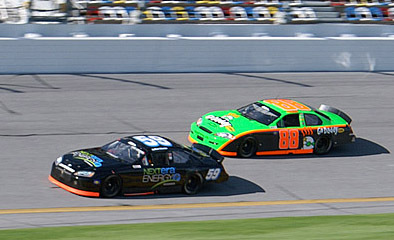 NASCAR is frequently mentioned as having the second-highest TV ratings of any regular season televised sport. And its fans are legion and loyal, so that if they’re running with you, you’ve got some influence to your agenda. The 122 year-old SportingNews now thinks NASCAR fans might listen to environmental topics, and so just featured two NASCAR racers as environmentalists, Brian Vickers and Münter. 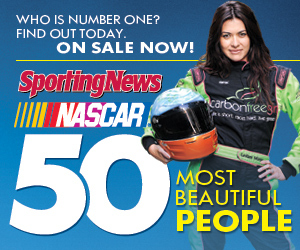 With an average paid circulation of 632,258 and around 4,000,000 readers, SportingNews just published its second collector’s yearbook, the “50 Most Beautiful People of NASCAR.” At the SportingNews Website, Münter is featured on its yearbook’s cover. At newsstands, her picture is one of seven and inside she received the most ink about her environmental interests. The vegetarian Münter races in NASCAR’s ARCA-RE/MAX series and IndyCar’s IndyLights. At the time of this writing, she’s testing in a Mark Gibson Racing Dodge at Daytona Speedway. 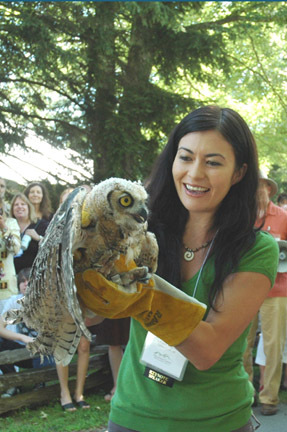 is an ambassador for the National Wildlife Federation. holds a bachelors degree in biology specializing in ecology, behavior and evolution from UC San Diego. has volunteered at a wildlife rescue and rehabilitation center. worked as a stunt and photo double for Catherine Zeta-Jones and has an IMDB entry. has modeled for magazines which include Italian Vogue, Esquire and Men’s Journal and even Reader’s Digest’s 10 Reasons to Love America. made periodic trips to Capitol Hill to speak before Congress about environmental legislation. has blogged for the Huffington Post. purchases an acre of endangered rain forest every time she races. has been filmed for the 2010 premiere of “Guardians of the Earth” on Discovery Channel’s Planet Green. set a new track record at Texas Motor Speedway as she finished 4th, highest finish for any woman racer. is the fourth woman in history to race in the Indy Pro Series. spoke at a Climate Action Rally on the steps of Capitol Hill alongside Senators Barbara Boxer, Joe Lieberman and John Kerry. Münter’s complement in public and government arenas is NWF’s “policy captain” Jeremy Symons, Senior Vice President for Conservation and Education. NWF bills itself as America’s largest conservation organization and strives to inspire Americans to protect wildlife for our children’s future. Symons is responsible for directing National Wildlife Federation’s overall efforts to fight the greatest threats to wildlife, by advancing effective solutions to global warming and restoring America’s wildlife conservation legacy in the face of new threats. NWF would like to help families across America rediscover the wonders of nature. served as Executive Director of NWF’s global warming campaign. stood among NWF’s top spokesmen on environmental and energy issues, having appeared on NBC Nightly News, Fox News, CBS Evening News, CNN, the News Hour with Jim Lehrer, ABC World News Tonight, National Public Radio and in other media. worked with Congress and other elected officials to advance global warming policies and clean energy initiatives. been acknowledged as one of the nation’s top nonprofit advocates by the respected The Hill newspaper. been climate policy advisor at the U.S. Environmental Protection Agency (EPA). worked on climate change and other environmental issues with Oregonian Senator Ron Wyden. 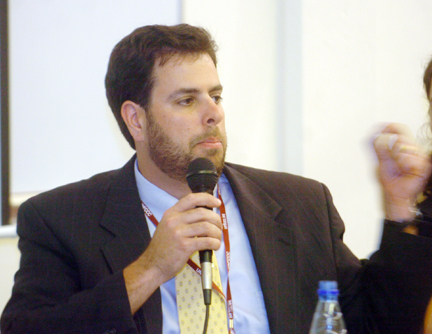 served as co-chair of the U.S. Climate Action Network, a coalition of more than sixty organizations across the nation. earned a masters degree in public policy from Georgetown University and a bachelors degree in environmental studies from Brown University. Symons is a “Go to” guy for knowing exactly what’s happening about the United States’ understanding of all things environmental. The legislation developing behind the scenes about hot environmental topics like global warming or even biological diversity are the kinds of things Jeremy fields day-in and day-out. So his perspective for America and its children is infinitely valuable. After all, we’re still living on a planet borrowed from our children. Hear the adventures and stories that Leilani and Jeremy have to tell us about their missions and successes, Monday, December 28, 2009 at 8:00 A.M. Pacific on Blue Planet Almanac radio. Blue Planet Almanac radio airs live with host Mike Austin on HealthyLife.net on the 4th Monday of each month at 8:00 A.M. Pacific Time. Blue Planet Almanac is also re-broadcast later in the week and shows are archived three days after airtime at that same site, with some available through the links below. HealthyLife.net is an all-positive talk station and has over 3 million listeners monthly in 104 countries and all 50 United States.